Equipped with the latest 4K Hexa Chroma Drive, this television speaks to you in a language of colours that your eyes would love and the brain would believe to be true. With the High Dynamic Range (HDR) enabled on this TV, the HDR enabled content mixed with the bright and crystal clear colour quality, reflects a picture that produces a level of reality too good to be true. The pictures look more crisper and more dynamic because of the IPS LED Super Bright Plus Panel by infusing the picture with more brightness and more clarity. Also, the Pure Picture Uniformity Sheet reduces the uneven brightness of the screen and also recreates pictures that are true to life. This Panasonic LED TV is equipped with a built-in home theatre system to give your ears a theatre like surround sound pleasure. Also, the sound system gives a real life feel in coordination with the real to life picture quality, complementing the whole experience. Also, this TV has multiple connectivity options such as 3 HDMI ports and 2 USB ports, using which you can transform your tv the way you want. And if that was not sufficient, your favourite online content can be accessed across the internet by connecting this Smart TV via a LAN PORT or even WiFi. Do you believe in having real life experiences, getting the real life feeling of true adventures and also living your fantasy life with just a click on the remote and without leaving the comfort of your couch? 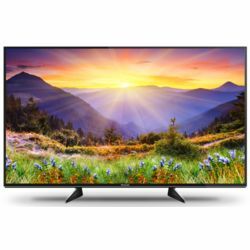 Then the you have a chance of feeling all this and more by experiencing television and watching a whole new world in itself in the form of Panasonic TH-55EX600 55 Inch Full HD LED TV. Scroll down to know more....A Treat To EyesEquipped with the latest 4K Hexa Chroma Drive, this television speaks to you in a language of colours that your eyes would love and the brain would believe to be true. With the High Dynamic Range (HDR) enabled on this TV, the HDR enabled content mixed with the bright and crystal clear colour quality, reflects a picture that produces a level of reality too good to be true. The pictures look more crisper and more dynamic because of the IPS LED Super Bright Plus Panel by infusing the picture with more brightness and more clarity. Also, the Pure Picture Uniformity Sheet reduces the uneven brightness of the screen and also recreates pictures that are true to life.Revolutionized Sound and Seamless ConnectivityThis Panasonic LED TV is equipped with a built-in home theatre system to give your ears a theatre like surround sound pleasure. Also, the sound system gives a real life feel in coordination with the real to life picture quality, complementing the whole experience. Also, this TV has multiple connectivity options such as 3 HDMI ports and 2 USB ports, using which you can transform your tv the way you want. And if that was not sufficient, your favourite online content can be accessed across the internet by connecting this Smart TV via a LAN PORT or even WiFi.